1Optical Systems Section, Code 8133, Naval Research Laboratory, Washington, D. C. 20375. 2The other authors are with Optron Systems, Inc., 3 Preston Court, Bedford, Massachusetts 01730. 3C. Warde’s permanent address is Room 13-3065, Massachusetts Institute of Technology, Cambridge, Massachusetts 02139. New results for an electron-beam-addressed liquid-crystal phase modulator are presented. Local, as well as global, control of liquid-crystal molecular reorientation is demonstrated, and the results of five different operating modes are discussed. Linear phase modulation with depths up to 30π are demonstrated with this device, as are two-dimensional arrays of computer-generated spherical lenses with actively variable focal lengths. The spherical lenses were written without the use of specialized transfer functions to compensate for device nonlinearities. 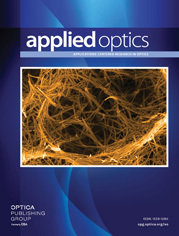 Applications are discussed in the context of adaptive optics in spaceborne systems.